Bopak Pak Choi Hybrid | Gurney's Seed & Nursery Co.
An award winner with superb flavor. This All-American Selections winner captures a unique flavor between cabbage and chard. Its tender leaves and sweet crisp stalks (that can be used in place of celery) add a robust texture to stir-fries, salads and more! An upright, compact habit makes this variety a perfect fit for both small gardens and containers or tucking in amongst other plants in a larger scale garden. 60 DAYS. Depth: Plant seeds 1/2 inch deep and 1-2 inches apart. Foliage: Dark green foliage atop bright white petioles. 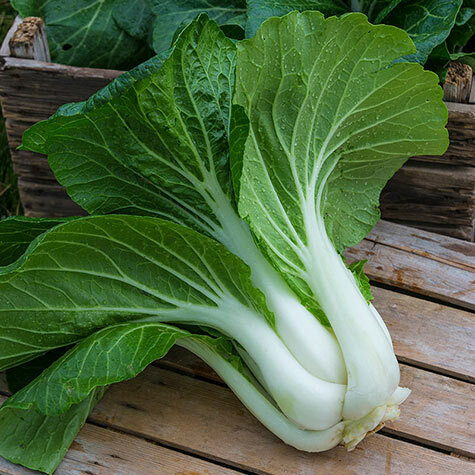 Tender leaves and crisp white stalks have a flavor in between cabbage and chard. Days To Maturity: 60 days to maturity, 45 for baby leaf. Germination: 4 - 7 days. Soil Requirements: Well-drained, fertile soil high in organic matter, pH 6.0-7.5. Comments: This is the first Pak Choi to become an AAS winner! Tender leaves, and sweet crisp stalks add delicious flavor and texture to stir-fries, salads, and other dishes. The sweet stalks can be used as you would celery sticks. Flavor can be described as between cabbage and chard. Keeps a nice flavor, even into warmer weather. Gorgeous contrast of rich, dark green leaves and bright white petioles make it a beautiful choice to use in edible landscaping. Use as an accent in a container for its attractive greenery and texture. Grows in an upright, dense, uniform, compact habit, making it great for small garden spaces. Matures a few days earlier than other varieties. May be harvested at full size, or harvested earlier as a baby Pak Choi.